Welcome to Week Three of the One Room Challenge! I can’t believe we’re already half way through, although I have to say I can’t wait to get my main floor back to normal. If you missed it click here for Week One our Rustic Scandinavian design plan and inspiration, or Week Two where we painted the rooms. 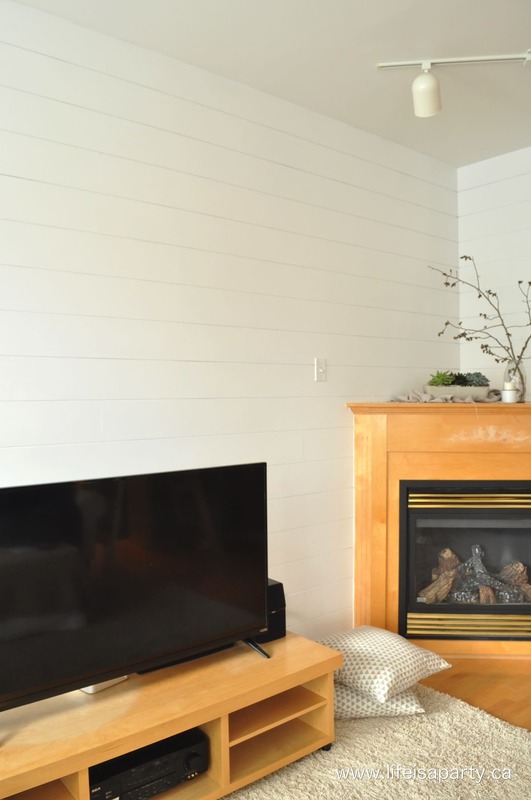 This week we installed DIY Shiplap on a feature wall in the living room. When I was designing the room, I was a little worried that all the white might be a little boring, so I knew I had to add in layers of texture to add interest and warmth to the space. 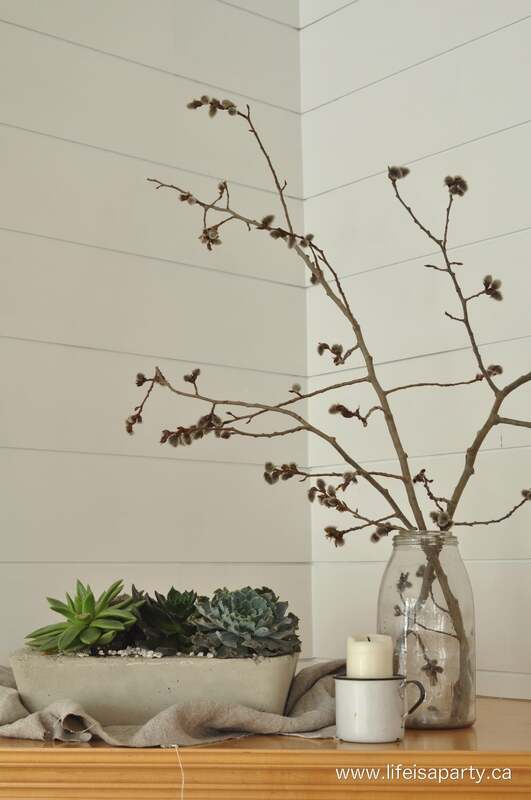 Shiplap has the perfect Rustic Scandinavian feel -although we’re used to seeing it used in the Modern Farmhouse look, it’s definitely at home in Scandi decor too. 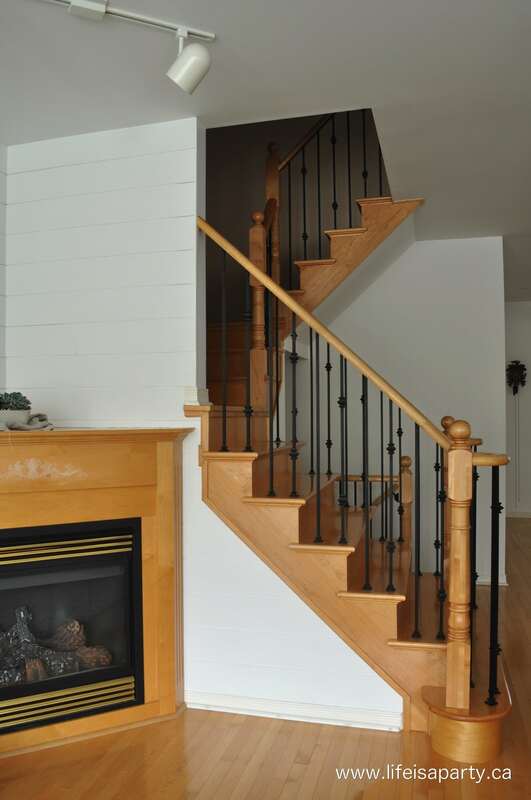 I was a little nervous about DIYing it myself, but my friend Kim of Kim Power Style has installed it herself in her beautiful Modern Coastal Cottage home and she talked me through the whole process. I decided to give it a try -although I was a little worried about all the crazy cuts and angles around the fireplace and stairs. I knew I wanted the shiplap on the feature wall, but since the fireplace is in the corner, I had to wrap it around that small wall too. I chatted about it with my brother-in-law Shaun, who has his own company Benjamin Woodworks, and got a few pointers and suggestions from him. By the end of the conversation though, he was volunteering to come and put it up for me. He’s truly the best. So we made a date for Easter Sunday for the install and my family all hung out and cooked a turkey together while he worked on the wall, and I chipped in where I could. Here’s a before shot of the space. 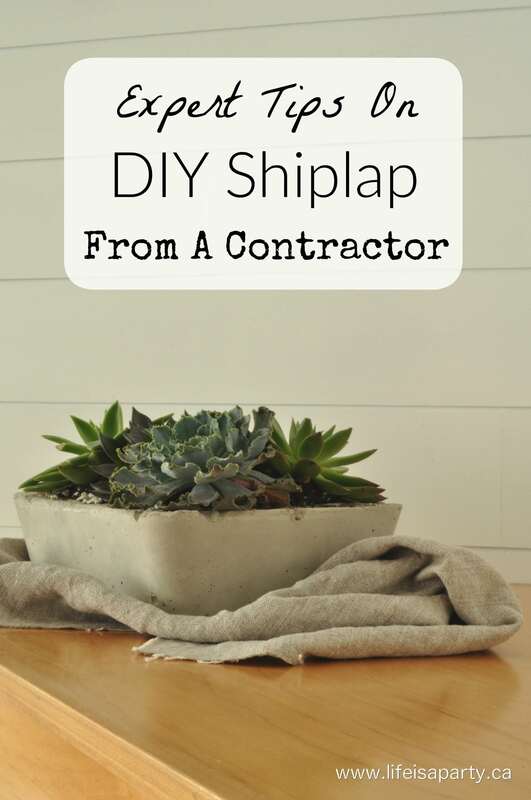 Shaun did an amazing job, and as he worked I gathered a few tips from the expert in case I ever want to try it on my own, or in case you’ve been thinking about doing DIY Shiplap in your home. 1. I looked at a few tutorials and took the advice of my friend Kim and decided to use 5.2 mm RevolutionPly Plywood to create the planks. 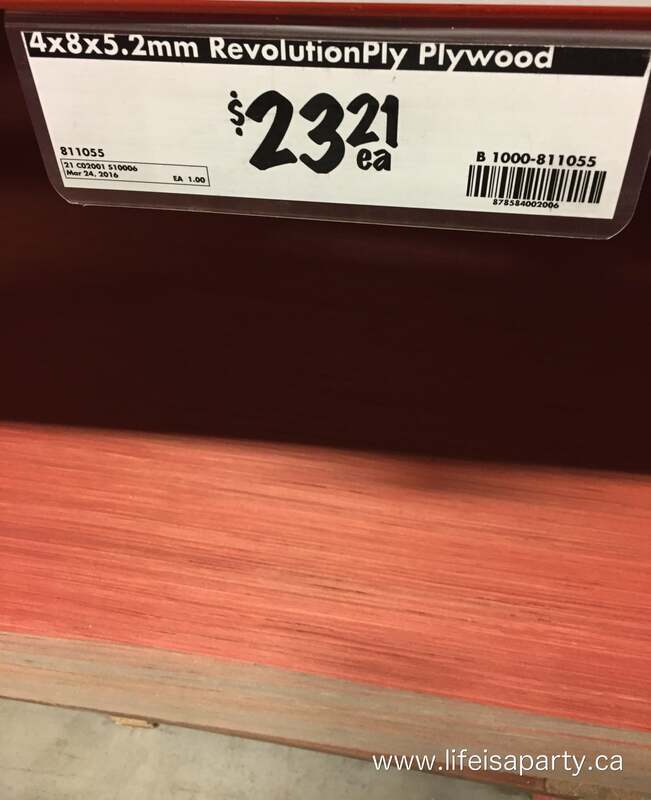 It was the cheapest option and looked great everywhere I saw it used. I had the wood pre-cut before so it was all ready for Shaun to install. We had the plywood cut into planks at the hardware store. They have a big machine that insures straight cuts, and is quite quick. We had them cut into 5 7/8 inch strips, so that with the gap in-between they’d be 6 inches. One little tip -make sure to keep your off cuts separate, you don’t want to mix them in by mistake and mess up your whole pattern when you’re installing them. 2. 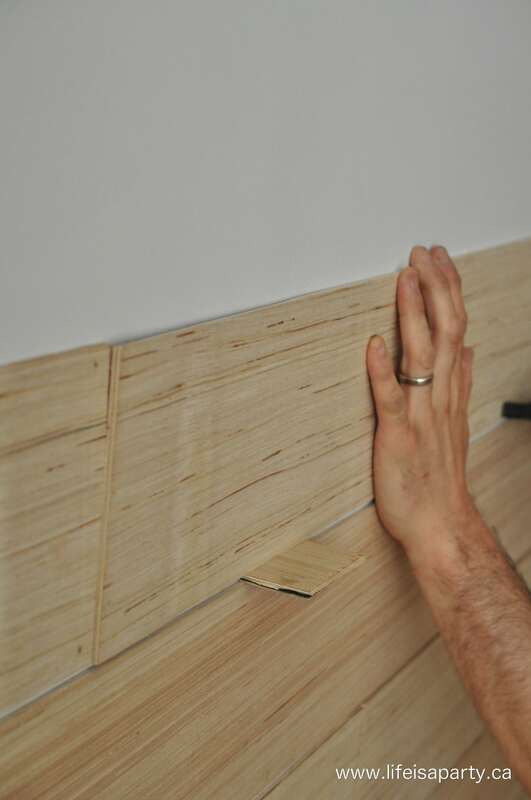 When you begin to install the shiplap on your wall start at the bottom with a level board. Our baseboard was surprisingly level so we didn’t have to adjust ours at all. But if yours is out a bit, make sure you get the top of that first board level. Start as you want to go. We used the width of the board as a spacer, giving us 3/16″ gaps. Be sure to keep checking occasionally that your boards are still level as you go up the wall. 3. We went with a staggered board pattern, and nailed them in with 1 1/4″ brad nails using an 18 gauge brad nail gun. This made the project go fairly quickly. Try and nail into the studs. You can find them with a stud finder and mark the wall if you need too. 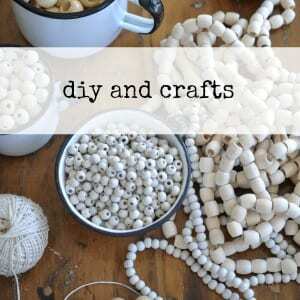 An expert tip, the outlets will be attached to studs, so start your search there. The studs will be equally spaced. 4. We cut the boards to length with a simple utility knife. Shaun said that the thin boards might be damaged with the up and down motion of a big saw, so he cut them using a set square for a straight edge, and a 1 inch utility knife -scoring a few times, and sanding off any rough edges. 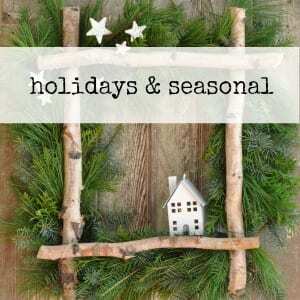 If you were worried about having to use a big saw for this project, you can do it with a simple utility knife. 5. I didn’t know this, but with the switch plate cover removed you can adjust the depth of you outlet boxes, with two simple screws. Shan adjusted them slightly so that they’d be flush with the new wall treatment. 6. 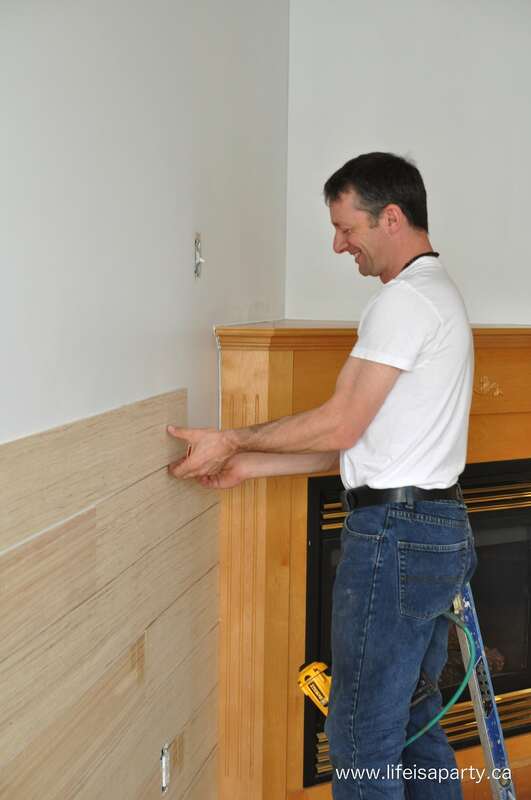 If you have some tricky cuts around something like a fireplace, like we did, here’s how the experts do it. Use an everyday geometry compass to scribe your difficult cut on to the wood. 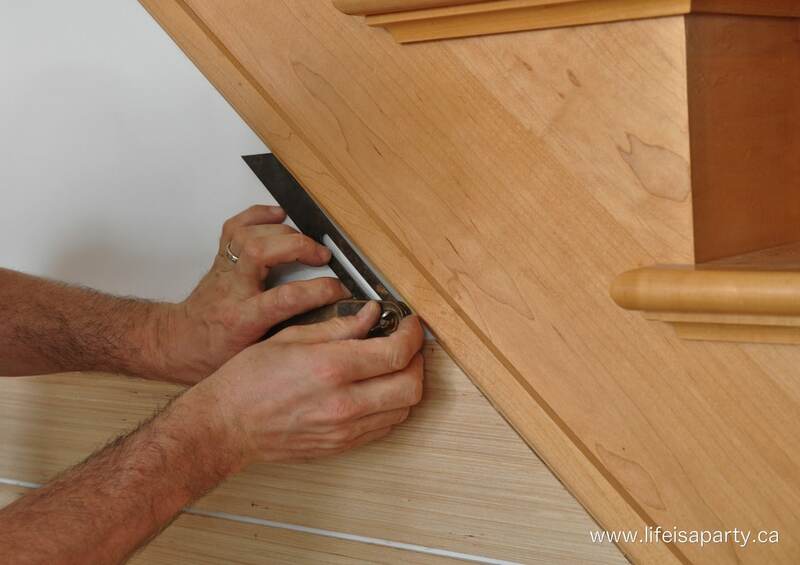 Set the compass, and then run the metal piece along the profile of the trim and use the pencil to transfer it to your wood. Shaun used a jigsaw to cut out these more difficult cuts, and then smoothed the edges with a file. 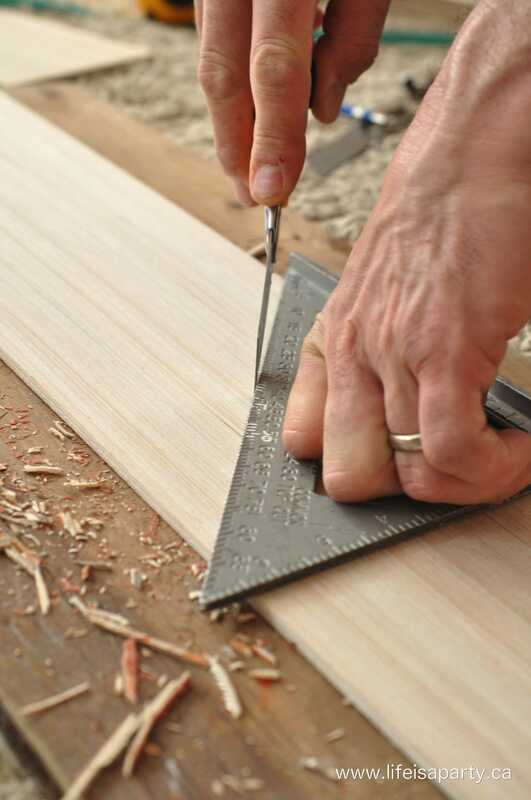 Another expert tip, draw it out and cut it first on a scrap piece of wood. When you’re happy with the fit, use it as a pattern and trace it on to the good board. If you’re working around a fireplace like we were, both sides should be the same, so you should be able to re-use your pattern piece. 7. 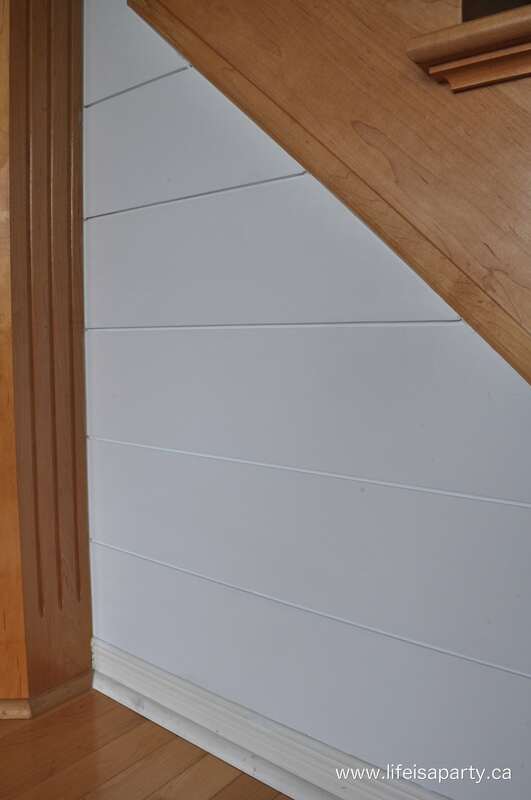 We had some funky angles along the trim on the stairs. There’s a simple tool you can use to get your angles perfect. 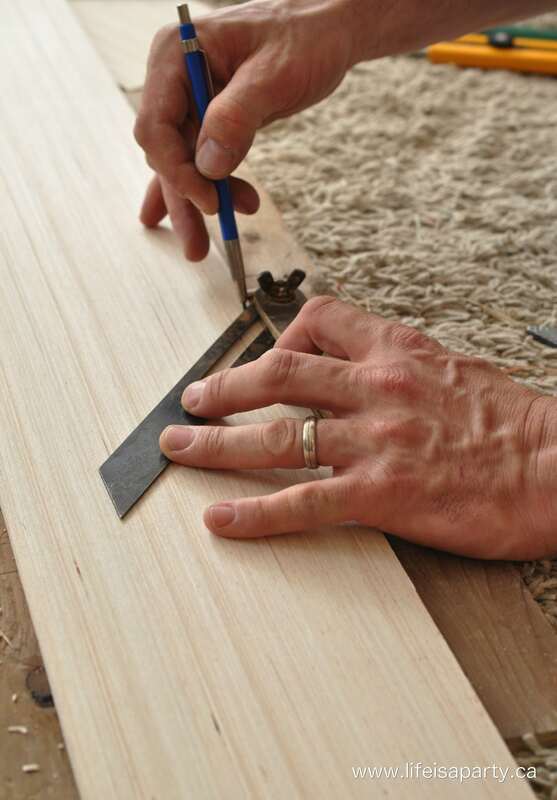 Just line up a carpenters sliding bevel to the trim edge and then move it over to your board and trace the exact angle on to your board. I love little tools like this one that make life so much easier! 8. Final expert tip, finish up with a little paintable caulking. 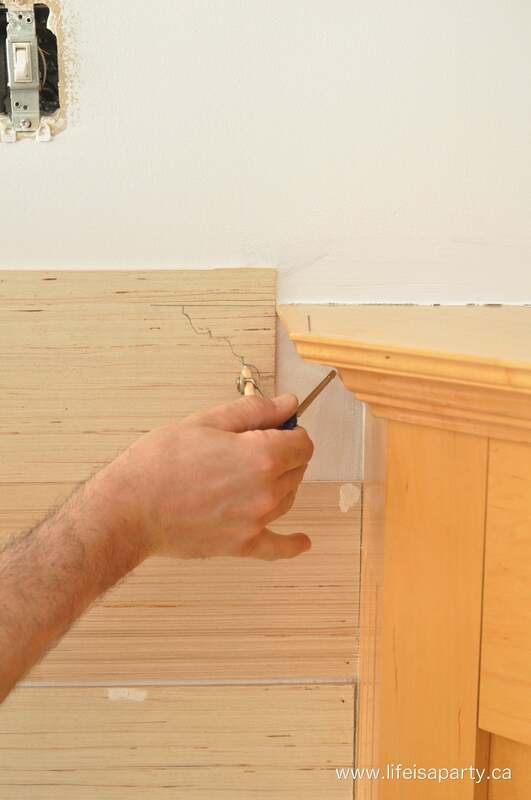 Even the experts have a few gaps here and there, for a professional finish caulk the edges around fireplaces, and trim where needed, the corners, and along the ceiling and baseboard. To finish, I filled the nail holes with a little filler, and then sanded it smooth. I vacuumed off the wall afterwards to remove the sanding dust, then it was time to paint. The Scandinavian look is all about white, so I used JoJo Whitewash by Para to match the rest of the room. I just love how it turned out. It feels rustic and warm and cozy. It was fairly inexpensive to do, and it really adds so much to the room. If you’re local to the GTA Shaun does AMAZING work and I highly recommend him for any tile or woodwork or renovating jobs you might need done. Check out his website -Benjamin Woodworks for more details about his work. It was so much fun to partner with him for this project. It’s already Week Three in the One Room Challenge and I still have a few projects to do. I’ve already painted the living room and kitchen, and now installed and painted the shiplap. The last big painting project is to re-do the fireplace. The brass is getting painted out, and the rest is getting painted white. I also need to refinish the kitchen table still. The new kitchen light needs to be installed too. 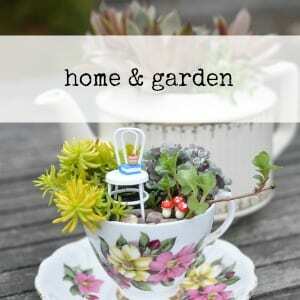 Finally I want to leave myself a little time at the end for some DIY artwork. So, there’s still lots to do, but it is starting to feel like we’re making progress. This week we bought new furniture for the living room that I can’t wait to show you. The rug also arrived and some of the beautiful accessories, along with the stunning new light for the kitchen. I hope to paint the fireplace over the next day or so, and finally put the painting stuff away! The kitchen table can get refinished in the garage now that the weather is nicer, hopefully that project will get started this week too. We’re getting there -slow but sure wins the race! Be sure to check in on everyone else’s Week Three One Room Challenge progress too. In the meantime, I’ll just be staring at my beautiful new shiplap wall. 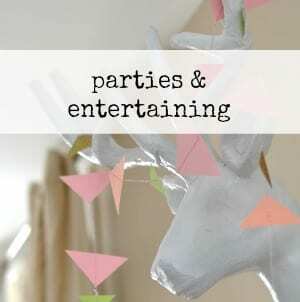 With DIY Shiplap, life really is a party! WOW! looks so good and i need a shaun in my life! Shaun is a genius! I would have never thought of that trick for the moldings. Looking good so far Dannyelle! Wow, this looks fabulous, Dannyelle! Thanks for these great tips. Your room already looks so much brighter; can’t wait to see it finished. LOVE your new shiplap wall! and I love that you are painting out the fireplace too! Exciting when it all starts to come together, I’m enjoying following your progress so much. I am in love! It looks so beautiful in your space, and you know I’m a sucker for white textured walls! So lovely! Looking forward to seeing more of this room come together! Love your new shiplap wall! I added one of my LAST ORC challenge (but my contractor hubby wouldn’t put it up for me…I had to hire someone!) 🙂 Looks fantastic! Your mom was right, she said I’d love all the creative’white’ changes your making to your home and decor. Terrific and inspiring step by step process. Beautiful work Shaun! Can’t wait to see the finished reveal. It turned out amazing! Really beautifully done. It gives a lot of character to the room. I would love to do something like this in my house. Thanks Jodi, it’s certainly getting brighter in here with all the white! 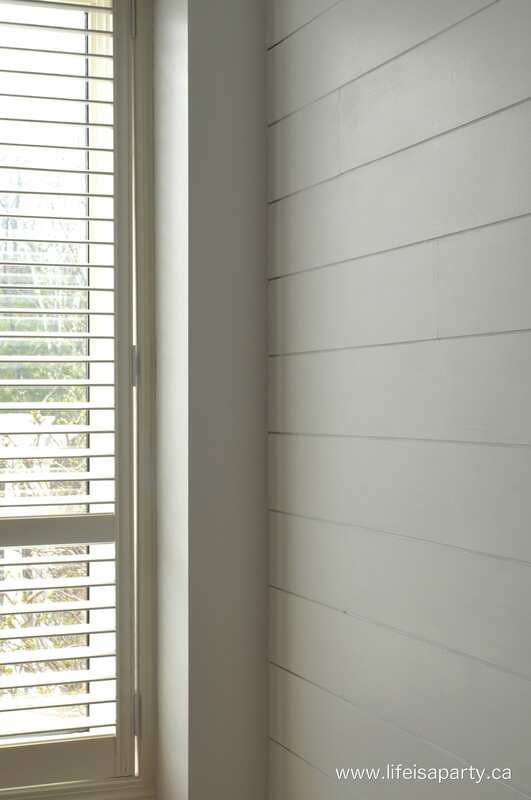 The shiplap is gorgeous! I love the tips on using a geometry compass and the carpenter’s bevel. Awesome job! It looks amazing! I’ll have to use that trick with a compass to get molding lines right! It turned out beautifully! Love Shaun’s way of doing around the fireplace. My way was not as quick and easy, Love seeing it all come together the way you envisioned! WHOA! What a huge transformation! It looks so crisp and clean! 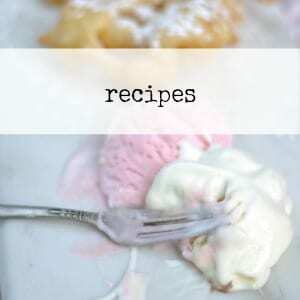 Great tips too – thanks for sharing them! Oh my gosh! I love how your shiplap turned out! And we used the same stuff for our kitchen shiplap backsplash. 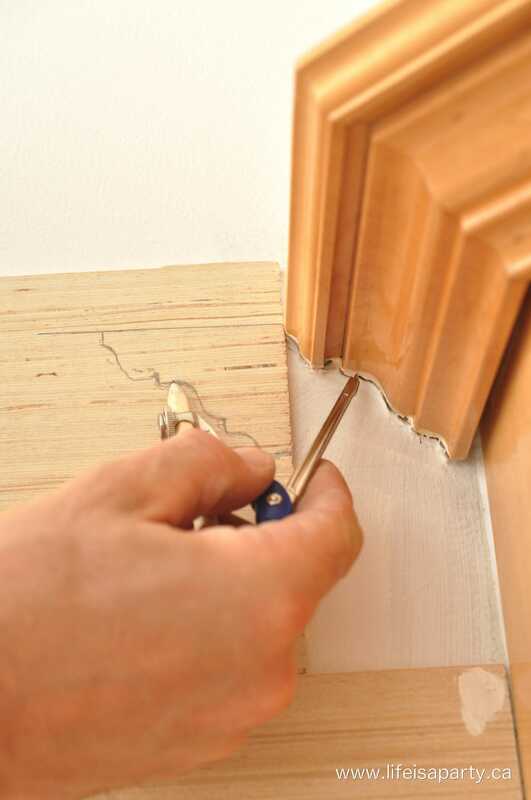 Great tips too – we’ve always said that caulking makes any trimwork look so professional! The shiplap looks so beautiful! 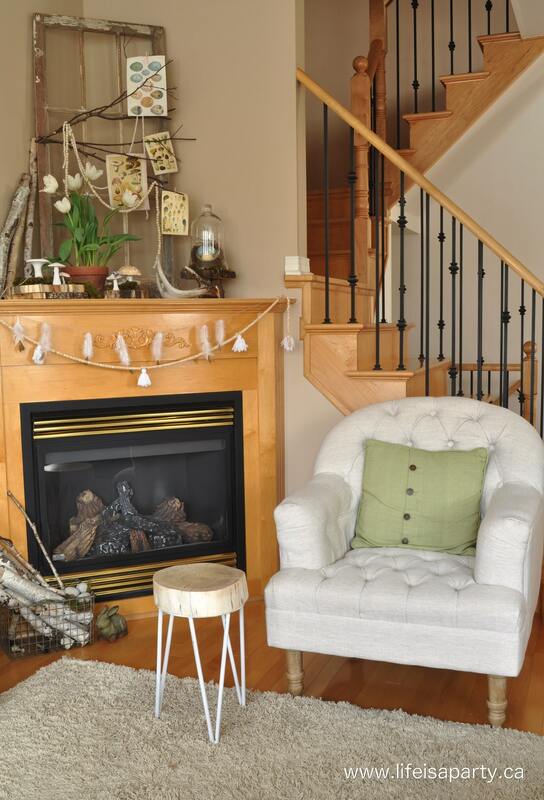 I love the tip about how to use the compass to cut around the fireplace! I am having major shiplap envy! 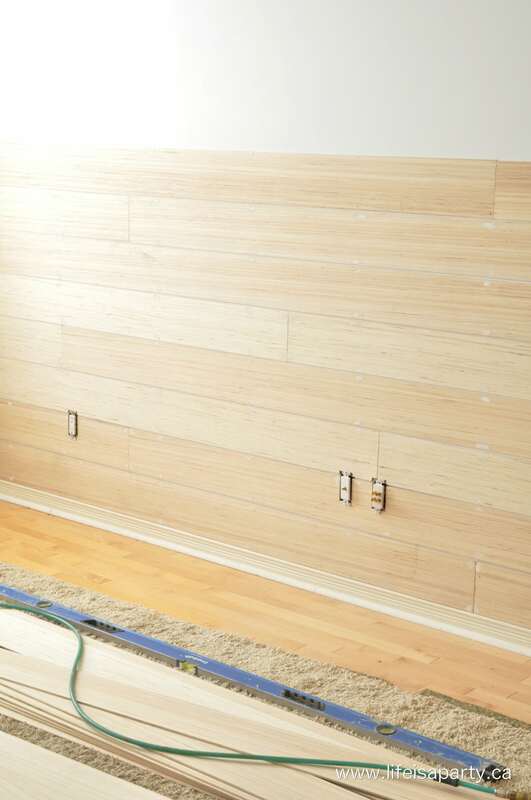 I have been wanting to shiplap and accent wall in my bedroom, but I don’t have any power tools … they actually kinda scare me…and I don’t know how I will cut around the electrical outlets and the lightswitch on my wall. It sound like you guys used a little saw and a box-cutter type knife? Hi Kerri, Yes, we used a utility knife. 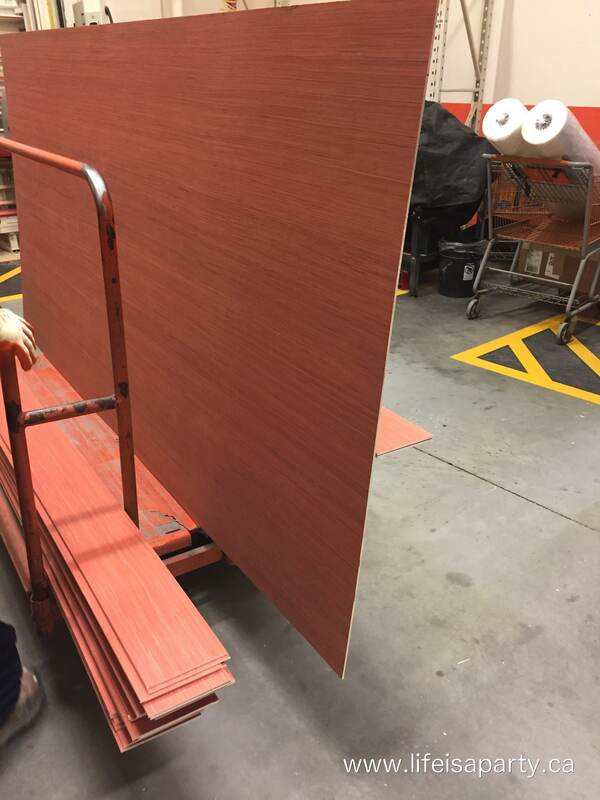 We took advantage of the cutting service at Home Depot to make the planks, and they’re so thin we were able to use just a utility knife for the rest of the cuts we needed to fit them. 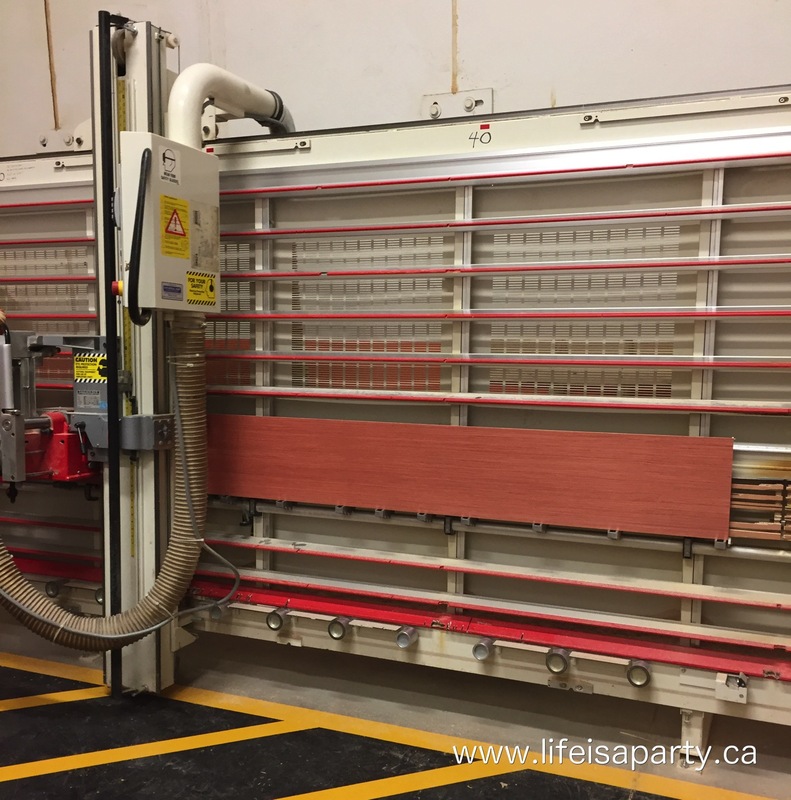 It depends on what material you use for the planks, but if you use what we did, it’s totally possible. We did use a nail gun, but you could totally do it with a regular old hammer and nails.